Following a consultation on drone use, a new proposed bill, put forward by the Department for Transport, would give UK police the powers to demand drone registration documents on request, as well as order the safe grounding of drones and even seize a consumer drone if they suspect it has been used in some form of criminal activity. In a statement to Parliament, the Department for Transport said that the government would look into mandating the use of drone safety apps from the UK’s main air traffic control provider NATS so that users will always be aware if they are straying into forbidden areas. 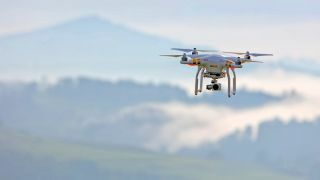 Other proposals include restricting drones to a maximum flying height of 400 feet and forbidding their use within certain proximity of an airport. Earlier this year, NATS released a video showing the chaos caused to air traffic when a consumer drone strayed too close to a Gatwick airport flight path. The pilots' union BALPA also said that there had been 81 incidents involving drones and planes in 2017, up from 71 in 2016 and 29 in 2015. Police have already been exercising various powers in order to curtail drone-related crime, particularly the use of drones to sneak contraband into prisons. The new proposals, however, represent a significant advancement of ideas presented earlier this year. These include mandatory registration for drones weighing more than 250g, which would cover many popular models such as the DJI Mavic and even the firm's compact Spark model. Safety awareness tests for anyone intending on flying a drone have also been put forward. The Department for Transport is also proceeding on 'Project Chatham', a data project being run in conjunction with the Civil Aviation Authority. Its purpose is to improve geo-fencing, a technology whose use would prevent drones from automatically entering restricted spaces. The draft bill is expected to be published in spring 2018, whereupon it will be open to amendments and consultation.